We make the cabinet, you make the collection. But we think you'll agree that this tall mirror curio displays your collection to perfection. 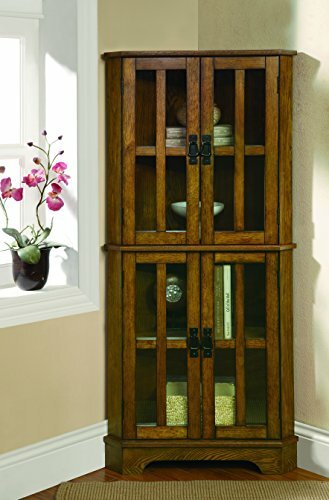 Our curio is built in select hardwood solids and veneers with a natural Estate Oak finish. Notice the traditional rope twist moldings and decorative medallions at the top. 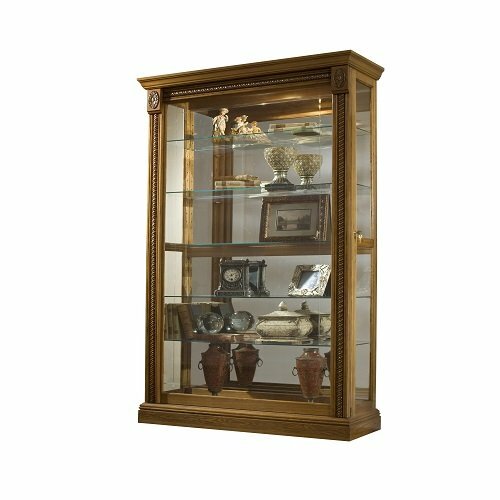 Our curio has a two-way felt-lined sliding door with lock, so you can easily adjust your display. It features elegant beveled glass on the door, a mirrored back, halogen lighting, adjustable glass shelves and adjustable glides for leveling. 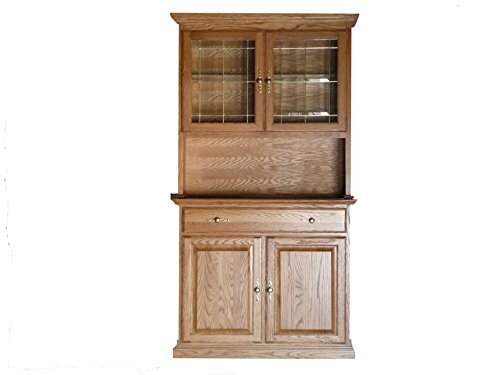 The Jamestown II Corner Display Cabinet by Howard Miller is finished in Golden Oak on select hardwoods and veneers. 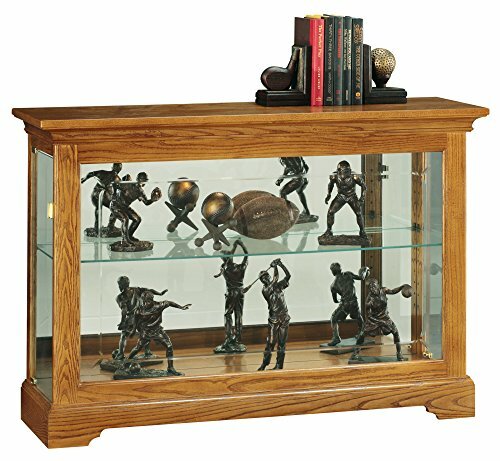 This elegant cabinet makes efficient use of space, and offers eight levels of display for your collectibles. Crystal-cut grooved glass on the door follows the curves of the pediment. Beveled glass on the front panel. Seven extra-deep, adjustable glass shelves with continuous holes for shield adjustment. Pad-Lock metal shelf clips lock shelves into place. Wall Dimension: 24-inch. Howard Miller offers a warranty which is our promise and commitment that our products have been manufactured using the finest materials and have been thoroughly inspected prior to being shipped from our facilities. Our warranty is available exclusively through authorized retailers only. Please inquire with any 3rd party seller prior to purchase to confirm warranty eligibility. Purchases made from unauthorized retailers will not be eligible for warranty services through Howard Miller or its authorized service center network. 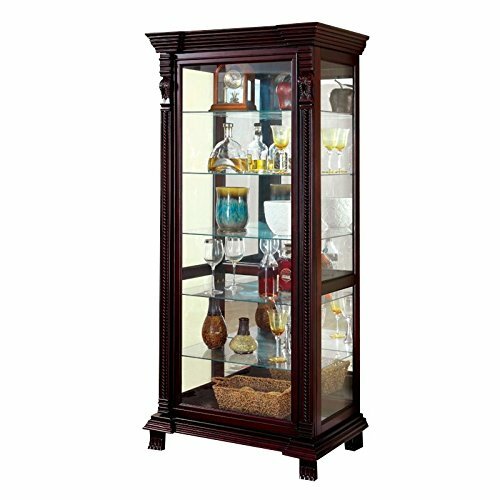 Traditionally styled with beautiful embellishments, this curio cabinet is absolutely striking. 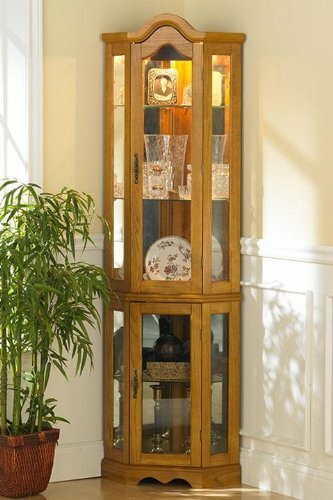 A rich, flame finish calls attention from all angles and an ornately decorated top with wood lattice and shapely curves makes this a centerpiece. Featuring five shelves behind a wood-frame glass panel door, plentiful room is provided for showcasing home accents and décor. Place in your dining room, living area, or office space to refine your home in class.